Why building a prototype? Because it answers inventor’s questions and generates new one, possibly help progress the function of the products in a long term. Because it validates your assumption that enables to build the confidence in the making process. Because it can inspire and compare alternatives to make sure that your creation is the one-off design. Most importantly, if it fails, it fails early and cheaply, compered to finding out failure when the production is done. Now entrepreneurs are putting more focus on developing prototypes, and for them, getting investors’ attention is imperative for gaining traction. Building a prototype is not as hard as you thought. In reality, it doesn’t take a huge investment of money and time to build a prototype today while we see lots startups got stuck in the process of making the first step. Firstly they don’t know where to find the manufacturer; they go for reputable manufacturing solution providers in the market, sending their ideas to these companies and then find out that to make a prototype of their creation costs 3 times more than they expected. What can they do? They created a profile in crowd funding websites only with a drawing showing in the case file. The aim of their funding is only to build a prototype. In fact, getting funding for making a prototype means you are already behind! Alternatively, these startups look for incubators and accelerators where they work together with startups to develop, manufacture and market the product and even finance the startups. They get some equity of your company in return. This sounds pretty attractive – they not only provide you a workspace to develop your invention sometimes they give you a tour out in China to oversee the manufacturing process. Let’s be fair though – how easy is it to be picked and seed by them? Before pitching them you already spent lots energy and time to prepare the documentation they require and most of time a design prototype model is one of the threshold. It is undeniable what these incubator and accelerator programmes can offer is a great support for the hardware startups, for those who have been picked. What about those unfortunately not been picked just because they don’t have enough fundings to prepare the application for their great ideas? Instead of seeking help from these large manufacturing solution providers or startup incubators in your home country, approaching oversea manufacture directly can be considered a straightforward and cost-effective solution, though sometimes can be challenging. There are some major factors to consider when you pick your manufacture located in China, for examples, some myths as well that I will elaborate more in the following articles. 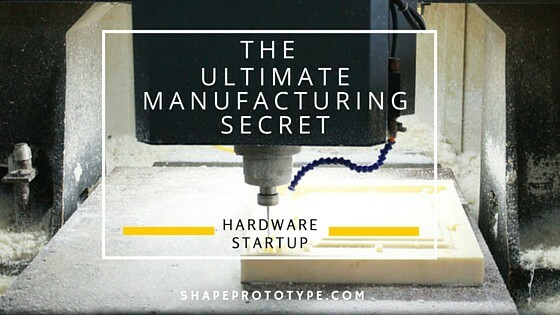 So you have the product drawing ready to fabricate a prototype or make a mould. You also have a manufacturing solution provider in mind who is located close to where you are, who claim to be capable of building your products without issues, also mange your project seamlessly. They will also tell you they have partners in the Far East who can make your products at a lower cost. All these statements give you a piece of mind, not until you receive the quote from them. Why is that? 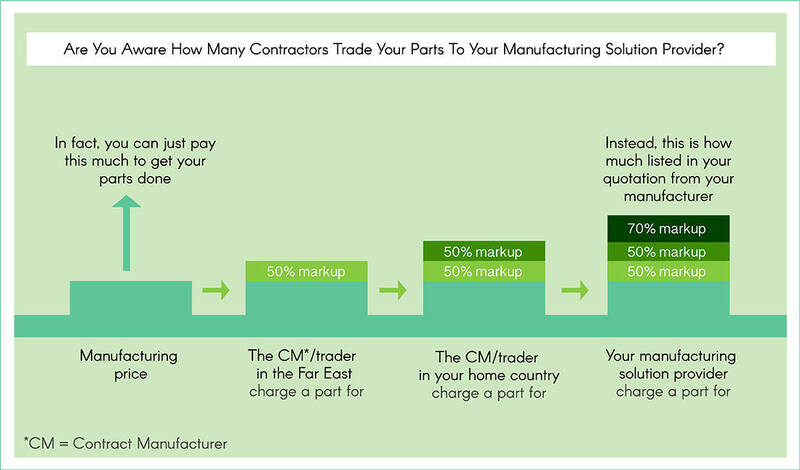 Here is a graph shows how manufacturing cost works out from the original supplier to your manufacturing solution provider. All the middle traders/agents/contractors get a cut in between. Sometimes, even your manufacturing solution provider don’t know how many cuts it has been passed onto them. The worst part is you have to pay ALL of it! Are You Aware How Many Contractors Trade Your Parts To Your Manufacturing Solution Provider? Having figured out all these, sometimes we can’t help thinking deeper and question- Is this really helping startups or small businesses? It is believed that, in many ways, minimising the manufacturing cost and provide efficient and effective prototyping or production solutions for startups and small businesses is one of the biggest support for them. As a startup, what do you think? Read more about other manufacturing myths – what type of manufactures you should go for, supplier relationship, quality issue all the factors you need to know before selecting a manufacturer.